Over time, our teeth can become yellow and stained. It occurs after years of drinking coffee in the mornings, enjoying red wine in the evenings, or smoking cigarettes/cigars. Even if you brush regularly, floss regularly, and have good dental hygiene, your teeth will still darken over time and that natural pearly white smile can turn a little less bright and a little less pearly. Luckily, with zoom whitening, that can be completely reversed in a matter of minutes. You may have heard about zoom whitening in NYC from advertisements or friends, but you are not sure of what exactly it is. Basically, zoom whitening is a tool that utilizes LED light technology at various intensities to whiten teeth up to eight shades in a single 45-minute session. In our NYC cosmetic dentistry office, we simply sit you down in a comfortable position to receive a positive whitening experience. 99% of patient report feeling little to no sensitivity. Zoom Whitening as compared to more traditional whitening tactics. Teeth whitening strips often take one or two weeks of regularly wearing an uncomfortable strip over your bottom and top teeth for sometimes hours on end. These strips can be dangerous and can strip irreplaceable protective tooth enamel. The same is also true for teeth whitening toothpaste. With zoom whitening, you are able to get better results without the risk of damage and in only a single 45-minute session versus days or even weeks of using over the counter methods. We use the number one patient-requested whitening system – the Phillips Zoom WhiteSpeed. This light-activated whitening system delivers guaranteed results using advanced LED light technology. It is backed by immense clinical evidence. 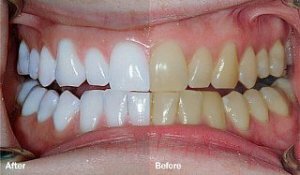 It is proven to whiten teeth up to eight shades in approximately 45 minutes. The Phillips Zoom WhiteSpeed has consistently outperformed competitors and allows Tribeca to remain on the forefront of the industry.